We have free versions of some of your favorite printable and coloring pages perfect for any Tinker Bell fan. So easy you just click, print, and play! Click Here to Print Them Now! The best part of being young is you can color anytime you like! So take a "coloring break" and dd some color to your favorite pixie's world. These adorable coloring pages are easy to use, just click, print and enjoy. Check out the Coloring Pages now! 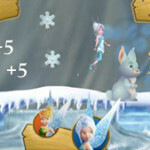 Tinker Bell loves to play games so we have tons of fun games to play right here, no download needed! They are sure to keep kids entertained for hours and coming back to play again and again! Start playing now! Looking for fun craft projects or activities to make your day special? We have some great craft activities that are not only fun for the kids, but for the entire family. Rainy days beware! Check out the Activities & Crafts now! The place where Tink comes to have fun and Tink Fans come to play games, watch videos, and just enjoy their Favorite Fairy. We have facebook timeline covers featuring Tinker Bell, coloring pages, activities and crafts, even fun "Tink Facts" you might not know. So enjoy your time at Tinker Bell's, we know she's glad you're here!